My name is Dr. Ellen Langer, and my books Mindfulness and The Power of Mindful Learning are used in a course offered by Professional Development Courses at the University of La Verne. For educators considering enrolling in this course, I would like to introduce these books. The books make forty years of research available in an accessible form for teachers, and show how they might use the ideas to help their students approach their classes more mindfully. Sadly, this research makes clear that mindlessness is pervasive. The majority of us — teachers and students alike—are mindless most of the time. Happily, the research also makes clear that mindfulness is easy, fun, and does not require meditation. For example, simply teaching with conditional language like “perhaps,”from one perspective,” “could be” has been shown to lead to mindful learning and engenders creative use of the presented information. The experiments described in these two books have shown that Mindfulness helps us to be innovative, less stressed, improves our memory, and also our relationships. When we’re mindful, we’re seen as charismatic and trustworthy. A mindful outlook also leaves its imprint on the products of our labor. Essentially, it feels good and is good for us. In The Power of Mindful Learning we see that when we learn mindfully, we recognize that information looks different from different perspectives. As a result, we come to accept uncertainty and stay open to information. When I lecture on Mindful Learning, for example, I often start by asking people “How much is 1+1?” Everyone dutifully answers “2.” But 1+1 is only sometimes 2. If you add one pile of laundry to one pile of laundry, 1+1= 1; one piece of chewing gum plus one piece of chewing gum = 1 piece of chewing gum. Because we tend to learn mindlessly, we’re frequently in error but rarely in doubt. In contrast, Mindful learning reveals all sorts of opportunities to which we’d otherwise be blind. Thank you for your feedback. Check back soon for the latest Author Blog! 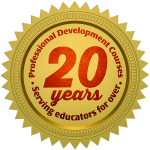 Thank you for offering these online professional development courses for teachers. I'm so glad I found your program. I've been able to use these courses for my salary advancement. Now I have another resource for how to choose my continuing education credits. GREAT blog! This course had a major impact on my own way of thinking but also how I interact with others. Thank you for opening my eyes. I hope others enjoy this course as much as I did! I need more of this in my life! I'll be enrolling now to take advantage of my spring break. I'll be telling my colleagues. Thank you for offering this course! Your email address will be kept private and not be visible on this blog. Your information will never be sold or used for other purposes. Please sign me up to receive the PDC Newsletter. Receive announcements, reminders, and updates! Please email me a digital copy of our course catalog!